Tenancy contracts are agreements made between the landlord who is letting the property and the tenant who will be renting a property. As with any contract there will be terms and conditions included and agreed between landlord and tenant. But with tenancy contracts there are certain conditions that have been laid down by law and must be adhered to. There is nothing legally wrong with a verbal contract between landlord and tenant, and in most cases a verbal contract will be legally binding. However, it is always wise to set down the contract in writing, and in some countries, such as Scotland, it is the legal right of the tenant to have a contract. Most landlords do provide tenancy contracts as a way of protecting the rights of both parties. The contract will set out the rules, requirements and obligations of both landlord and tenant. The written contract is particularly useful as a reference point if any dispute does occur. The terms and conditions should be specific and clearly defined on issues such as rent payments and periods of notice to quit. If any of the terms and conditions is broken and the matter does come to a legal court then the written contract can be used as evidence during the case. Each landlord will usually have their own standard contract that will be issued to the tenants. There are certain statutory rights that have been set down in law and must be adhered to. A tenancy contract can give more rights to the tenant than is required by law but it cannot give less than is required. Any tenancy contract that has less than the required statutory rights may be unenforceable in a court of law. The names and addresses of tenant and landlord. The property address that is being let. The Date of entry to the property. The rental amount and frequency of payment. Type of tenancy, for example short term or assured tenancy. Details of notice needed to quit the property. Also include in the contract will be information on eviction, the right to apply for a rent assessment, and which housing act applies to the tenancy. There will also be clauses on the responsibility of repairs to the property, whether the flat is to be furnished or not, and inventory details. There may also be details on whether pets are allowed and details on permission needed to make alterations to the property. There will also be a page for signatures, dates and witness signatures. Once all the terms and conditions have been agreed and the contract has been signed, and agreed monies have been paid then the contract is legally binding. There may also be certain terms and conditions that were agreed between tenant and landlord but not set down in writing, these are known as implied terms. These agreements usually cover such issues as repairs to the property, taking appropriate care of the property, and the right to be treated fairly with regards to religion, race, and sexual issues. The implied terms will still form part of the binding contract even if they have not been written into the actual tenancy contract. A breach of the tenancy contract may occur if either the landlord or the tenant breaks any of the contract’s terms and conditions. For example a landlord who decides that they want their tenant to vacate the premises immediately without giving notice can be in breach of contract. The matter can then be taken to a court of law where the contract’s terms and conditions will be reviewed and a judge will make a decision as to whether to uphold the breach of contract. Tenancy contracts are legally binding contracts and as such there should be no changes to the original contract without agreement from both landlord and tenant. If both parties agree to the changes then a new contract can be put in place or amendments can be made to the original contract. 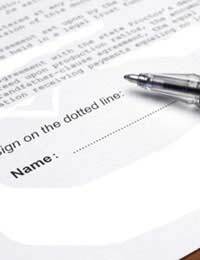 Tenancy contracts are important documents as they provide both proof of the agreement and give protection to tenants. If any tenant has doubts over their contract then they should contact their local Citizen’s Advice office. Any contract terms that are found to be unfair to the tenant can mean that the contract is unenforceable in a court of law, and there could be serious consequences for the landlord. My daughter has a student tenancy agreement where they are all jointly responsiblefor the rent.The landlord has gone bankrupt and sold the property. Are they still bound by the agreement? My wife and I are currently living in a private rented accommodation in Scotland. The rental agreement is in both our names but only I have signed the agreement. Is this document still binding given only one person named in the agreement has signed. @dawood - is this UK-based law? As I am afraid I am unable to advise if it is outside the UK, because of different laws. my legal question is my grandfather &grandmother andthe ownsign and sealagreement to purchase his house april 23 1963.the agreement was sign and seal by all three parties , after my grandfather was killed in Oct 9 1968 my grandmother filed a declaration of homestead sept 9 1974. then executedher promissory not for the sum 13,900.098 jan 4 1980. I have research for weeks turning into months at the adams county public records finding no documents of breaching,liens or delinquent or foreclosures ,release of deeds of trust nor transfer of ownership with signatures or evictions, even title research. she passed away in 2002 and the property ended up in another person name with the copies of signature of the owner showing no agreements, contracts or land cerificates of purchase and then when to an LLC, now the property own itself with another address and I have all documention showing merit to my claim can your company point me down the right road. Thank you. @angela - same thing happened to me with my tenant, it was quite handy that the boiler broke, the tenant had the cheek to ask me after not paying rent to come and fix it, of course I didn't and she didn't stick around long without any heating in the winter. @angela - this is always a tough one as in many cases a landlord will have to go to court to regain possession of their property. If a landlord goes in and changes the locks, then this is harassment and a criminal offence. So there can't be any recourse against yourself we can only advise you go by the book. my tenant is behind on his rent, has not purchased the necessary insurance asked for inhis contract, has also been smoking in the property.his contract ended in January but he has to,d me he will not leave and basically became quite volatile and aggressive when I gave him his letter stating that his contract would not be renewed.I thought I was being fair by giving him until mid February but he told me to F off and said I would not be getting any future payments either, he is fully aware that it could take months to get him out. is there anything I can do apart from dragging this out through the courts. @exasperated. She should get her holding deposit back if you were not told of these details before she signed up to that particular flat, especially if the landlord has changed his/her mind about her having the flat. Only advice I can give is keep trying the agency.Kerry. my landlady had a verbal agreement that she could stay in the rented property as long as she payed the rent, so with the land lords permission she paid out of her own money to improve the property so to make a home for herself. she put in a new kitchen, gas central heating, a new bathroom, and decorated the house inside top to bottom. after being there 24 years, the landlord sold all nine terraced houses, the new landlords are selling the propertys, she has a short lease agreement, she is 65 yrs old, the council cant help her, so she is being made homeless, nowhere to store her belongings, how is this possible? anybody have any ideas about this? My daughter is in shared student accommodation and two of her housemates have their boyfriends living there as well.As their names are not on the tenancy agreement, what actionif any, would the Estate Agents take if they find out? Our tenancy agreement states that if our landlord wishes to deduct money from our deposit after we move out he has to inform us within 10 working days, if he has failed to inform us within that period can he still withhold money from our deposit ? Is a letting contract signed in England for a property in Spain valid in this country in the event of a breach of contract etc? Is a tenancy agreement contract valid if it is signed many months after the date which is on the contract?It was signed in February and backdated to end of September 2010.